At 0802h local time this morning, we left our berth in Montego Bay, Jamaica. Was there a noticeable difference in the feel of the deck beneath our feet, as we slipped our last mooring line, and the ship was free to begin her journey? Perhaps. We've since made good time, thanks to calm weather and a favourable current, which is taking us ever closer to our first target site. Finally, after a couple days that passed in a blur as we prepared for departure, I feel I can start to settle into the rhythm and routine of life aboard a research ship again. 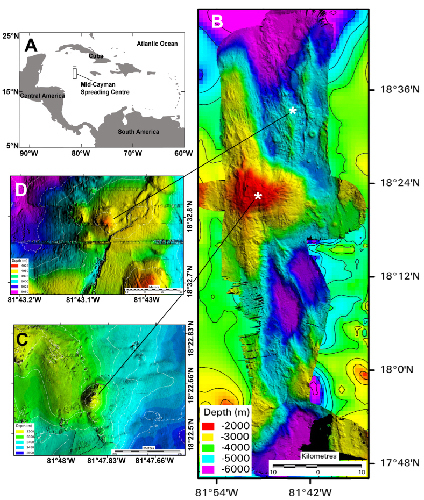 Our destination, which we should reach tomorrow morning, is an undersea volcanic rift that runs for 110 kilometres south of the Cayman Islands. Back in April 2010, Voyage 44 of the James Cook revealed deep-sea vents on the seafloor here, previously detected in the area by a US expedition, and now we're returning to investigate those discoveries in more detail. The undersea vents here include the deepest known so far, five kilometres beneath the waves. There are also some of the world's strangest vents here, on an undersea mountain where no such vents should exist, with mysterious mineral deposits that don't seem to match the hot fluids now gushing out of the crust. Over the next three weeks, our investigation of these deep-sea mysteries should help us to understand more about the geological processes that shape our world, the geochemical reactions that regulate the oceans, and how species disperse and evolve in the deep sea that covers most of our planet. 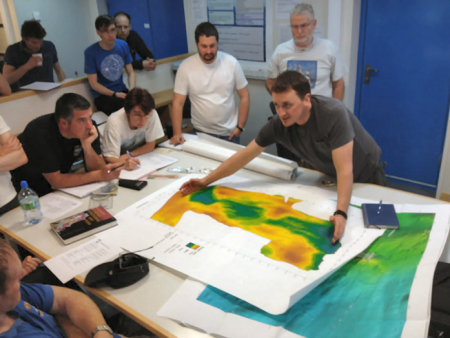 For the science team on this expedition, we've brought together biologists, geologists, chemists and oceanographers. We have a contingent of research students and early career scientists who have been brimming with new ideas as we've discussed and refined our plans. I'm also lucky to have several senior scientists aboard, who have brought a wealth of experience and perspective with them. I'm sure we'll need to draw on both in the days ahead, as unexpected challenges to plans are routine in work at sea, whether for technical, operational, or meteorological reasons. It's great to be aboard the James Cook again with the Isis remotely-operated vehicle, which will be our eyes and arms for working on the ocean floor. Although I'm biased, that combination is a world-leading facility for deep-sea science, not just because of the hardware but also the team of people who run it. We've already successfully tested the ingenuity of the ROV team today, with last-minute demands for various samplers to be added to the vehicle, and space found to carry yet more experiments to the seafloor when we arrive. The corridors are quiet this evening, as team members settle into their shift patterns for the intense programme of work that starts tomorrow.